Everyone close to me knows I've been talking a lot about karaoke lately. I'm a terrible singer—like, really terrible—but there's something simply magical (even therapeutic and joyful, dare I say) about singing your favorite song at the top of your lungs while your friends sing along, too. So, naturally, I loved hearing about how Christina and Kamille officially decided to start their podcast after a night of karaoke. What a perfect catalyst for launching a creative project. The two women have now been making their show—called the Unfriendly Black Hotties—since 2015. In it, they discuss everything from higher ed (where they work), to current events, to fashion, books, TV, film, and beyond. Their insights are smart, searing, and often funny. And it's not just that listening to them talk is entertaining and enlightening—it's truly a pleasure to sit at the table of their friendship. Here, Christina and Kamille talk about how they work together, how their collaboration has impacted their lives, and what they gain from their partnership. Where and when and how did your friendship begin? Christina: It was a fine spring day when I started my first day of work at Harvard. On an office tour, I was introduced to a young woman named Kamille, who I quickly noticed was around my age and brown, which made me want to befriend her immediately. During our yearly staff outing, she made a joke about not trusting white folks on boats because of Amistad, and the rest, as they say, was history. Kamille: It had to be said. I still don’t love to be on boats with white people tbh. Anyhow after that outing, we began tentatively Facebook messaging each other at work. There was a moment when we successfully quoted The Read at each other (which at the time was still a relatively niche podcast), and that really sealed the deal. About a month after we met, we made the bold choice to take a boat to Salem together for half a day... FOR OUR VERY FIRST SOLO HANG. We go big. During our yearly staff outing, she made a joke about not trusting white folks on boats because of Amistad, and the rest, as they say, was history. How did you decide to start Unfriendly Black Hotties together? Why did you decide to do it? Christina: I think podcasting was always something that we felt like made sense for our dynamic. People seemed to like listening to us jabber away in our weird and highly specific vernacular. We had been discussing the possibility of doing a podcast for a while and after a night of gay karaoke, our Uber drivers were so delighted by our chatter that we felt like, okay we gotta do this. Kamille: Man, I really wish we had thought to record that Uber ride! And granted, we were both tipsy and my wig was probably highly askew, but I’m pretty sure we were legit comedic geniuses for that half hour ride. Our friends and coworkers had always thought we were an entertaining duo, but that Uber ride was the affirmation from total strangers that we needed to take the leap. After night of gay karaoke, our Uber drivers were so delighted by our chatter that we felt like, okay, we gotta do this. What does your process of working together look like? Christina: In the beginning, we were a little over confident, I think, and felt like we could just hop on the mic and have a brilliant show. We learned that is… a nice dream, but certainly not something that was working every time. Now we make a point to have editorial meetings, to think about things that we want to cover and things that are being discussed by other places. I’ve also gotten a lot better at writing notes and doing show prep. While a lot of what makes the podcast work is our natural chemistry, I need notes to stay focused. Kamille: Establishing regular editorial meetings really changed the game for us. We are in constant communication pretty much always, so it was really helpful to set up a Slack channel to contain all our UBH-specific conversations. Before we did that, we would just lose track of things in our various iMessage and Gchat threads. We record on Sunday mornings—usually about an hour’s worth of material for each episode. CT will do the first editing pass, and then I do the fine-tuning and add in our ~*transition music*~. I usually write the episode descriptions and do the initial Facebook and website posts, and CT feeds the Twitter hypebeast. In the beginning, we were a little over confident, I think, and felt like we could just hop on the mic and have a brilliant show. We learned that is a nice dream, but certainly not something that was working every time. How do your individual strengths or skills complement each other in your work? Kamille: We got really, really lucky. I’m your classic type-A planner/organizer/decider. I’m like a brown Marnie, except with a good personality and the ability to pull off hats. It’s great! But (reader, you know where this is going), the intensity that made me everyone’s favorite workhorse during science fair season is the same intensity that made me everyone’s least favorite workhorse during science fair season. CT has all the fluidity and chill vibes that I lack. Plus, she is a straight-up wizard at Twitter. Now don’t get me wrong: I’ve gotten better at it for sure, and I can rattle off a zany tweetstorm with the best of them. But, the fact of the matter is, I’m a pretty private, quiet person in real life. Twitter just doesn’t come naturally to me. CT, on the other hand, has that strategy on lock. Christina: Of course, there is a less productive flip side to being chill and fluid. I require a lot of accountability to get things done, so knowing that KW needs me to get the show edited by a certain time helps me stay on task. I think there was a moment where we realized that I need someone to directly tell me what they need from me, whereas KW has an ability to intuit what the next steps of a project should be. I remember a moment where KW felt weird directly asking me for something, and I kept feeling that something was expected of me but I didn’t know exactly what. Once we had that conversation, our work and expectations of one another got a lot easier to manage. I require a lot of accountability to get things done, so knowing that KW needs me to get the show edited by a certain time helps me stay on task. How has your collaboration impacted your individual work/life outside of your collaboration? Kamille: In my day job, I work on higher ed international policy and partnerships. Our conversations on the podcast always inform my stance in conversations with higher ed big/medium-wigs. How can we get more people of color and first generation students to travel abroad? In this new political hellscape, who do we need to be advocating for? Is there institutional support we can provide that we aren’t already? If not, why not? And in terms of my personal relationships, the podcast has been a goddess-send. There are so many people in my life that I would not know were it not for the Unfriendly Black Hotties. Wednesdays have become my favorite day of the week, because I know that after I hit “Publish” on a new episode, I’m gonna get to have a bunch of great text and tweet convos with my favorite people. Christina: I work in Student Affairs, so my day job is more in administrative processing realm, but I have frequent contact with our students. I am involved in a lot of conversations about policy at work, so the reading we do for the show allows me to gain wider understandings of who those policies affect and how. We’ve also been able to get involved with other projects because of the show—we were both featured on the Historically Black podcast The Washington Post put together, something that would have never happened without our show. And, as KW said, the friendships! The people in my life right now that I met through doing this show are so wonderful and bring me so much joy on a regular basis. I can’t imagine life without them. Kamille: A quality we both share is extreme risk aversion. Without the safe space of our partnership, I think we’d both be a lot less open to sharing our personal experiences, and a lot less willing to take creative risks. Things that seem ludicrous when I’m alone seem totally reasonable within the happy bubble of our partnership. I also think that working together on a project has been a real growing experience for our friendship. Sure, you can be friends with someone, but once you decide to put something out into the world together, you fundamentally changes the stakes. And honestly, this could have gone really really wrong! This was a big gamble! But the fact that we’ve done this kind-of-wild thing and succeeded says amazing things about our bond. Things that seem ludicrous when I’m alone seem totally reasonable within the happy bubble of our partnership. Christina: Oh man there is nothing more I love than not taking risks; than the comfort of stability. I don’t know if I can manage to put into words how much I’ve gained from having a space where I not only feel encouraged to take risks, but that I have the ability to create something worthwhile. I am a person who spends a lot of my time comparing myself to others, and typically finding myself lacking in someway. And because I am so risk adverse, I am often willing to throw in the towel and say, “Well, so and so is already doing something like this and doing it better than I could, so I won’t even try?” Being with KW and having a partner who is willing to encourage me and make me feel like not only can we do anything, we’ll be damn good at it, is just *kisses fingertips* wonderful. I don’t know if I can manage to put into words how much I’ve gained from having a space where I not only feel encouraged to take risks, but that I have the ability to create something worthwhile. The Unfriendly Black Hotties is a podcast about higher ed, pop culture, and pop culture that centers the experiences of queer women of color. Listen on iTunes and SoundCloud, and connect on Facebook and Twitter @theblackhotties. 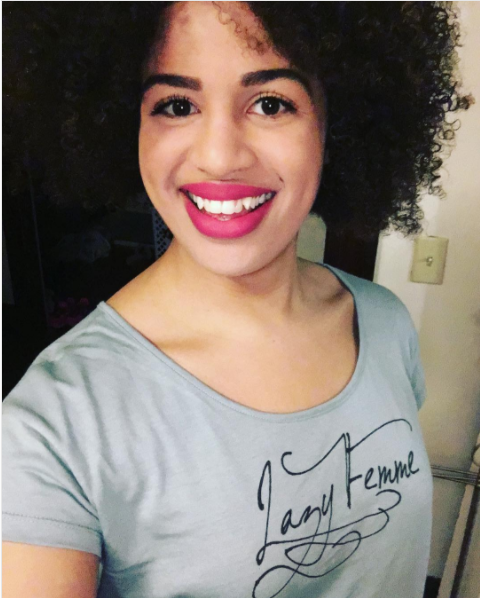 Kamille Washington (KW) is a podcaster based in Boston, MA. She finances her wig habit by managing international things at Harvard. In her spare time, she enjoys Muay Thai, bagels, and yelling at straight white dudes. Find her on Twitter @thatblasiangirl, and on Instagram @not_kamille. Christina Grace (CT) is the one half of the Black Hotties and works in Student Affairs at Harvard. She is perhaps most aptly described as CJ Cregg + Donna Meagle, and spends most of her time thinking about what colors of lipstick her ever expanding collection requires. You can talk to her about Beyoncé at anytime on Twitter at @C_GraceT and on Instagram @christina_gracet.